Statement: Jacqueline Fleming, 38, was "ill in hospital for a number of weeks"
Scottish government: Patient had "underlying health conditions"
LONDON, England (CNN) -- A person with swine flu died in Scotland on Sunday, the government announced, marking the first known death of a swine flu patient outside of the Americas, according to the latest World Health Organization information. 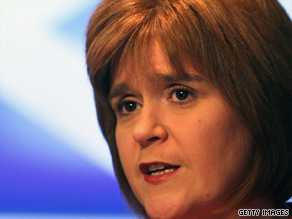 Scottish Health Secretary Nicola Sturgeon stressed most cases of "swine flu" are not severe. Jacqueline Fleming, 38, had been "ill in hospital for a number of weeks," her family said in a statement Monday. "Our whole family is absolutely devastated and we are doing everything we can to support Jacqueline's sons and her partner," the statement said. She had "underlying health conditions," the Scottish government said, without elaborating. "We are now waiting for the results of the death certificate to determine the cause of death," the statement said. A total of 145 people had died from the H1N1 virus, as swine flu is officially known, as of Friday, according to the WHO. More than two-thirds of the deaths were in Mexico, where the outbreak was first detected. There have also been 27 deaths in the United States, four in Canada, two in Chile, and one each in Colombia, Costa Rica, the Dominican Republic and Guatemala. Scottish Health Secretary Nicola Sturgeon said most cases of swine flu are not severe. "Tragic though today's death is, I would like to emphasize that the vast majority of those who have H1N1 are suffering from relatively mild symptoms," she said in a statement Sunday. "The risk to the general public remains low." The WHO declared last week that swine flu had become a global pandemic -- the organization's first such announcement in more than 40 years. Increasing the alert to Phase 6 does not mean that the disease is deadlier or more dangerous, only that it has spread to more countries, the WHO said Thursday. The last pandemic was declared in 1968. Time: H1N1: Is this a pandemic or isn't it? U.S. Health and Human Services Secretary Kathleen Sebelius said Sunday that the federal government could have a vaccine for the H1N1 flu virus ready by the fall if necessary. "We are certainly making every effort to be totally prepared," Sebelius said on CNN's "State of the Union." She added that the production of a swine flu vaccine could begin as early as the end of the summer and be ready by the fall if a vaccination program were ultimately recommended. "The good news is it still seems like not such a lethal virus," Sebelius said. "But we are fully prepared. ... Preparation is very much under way for what may happen this fall." As of Friday, the virus had spread to 74 countries and territories, the WHO said. There were 29,669 confirmed cases. The Phase 6 pandemic designation had been widely expected for weeks. "Further spread is considered inevitable," WHO Director General Margaret Chan said at a news conference at the agency's headquarters in Geneva, Switzerland. The announcement came after a meeting of the WHO's Emergency Committee, which had debated since April whether the spread of a novel H1N1 flu virus was fast and widespread enough to warrant a Phase 6 designation. Phase 6, Chan said, is meant as a signal to countries to recalibrate their strategies to minimize the harm from swine flu. In countries where the virus and the response to it are already widespread, it is not likely to mean significant changes. But Chan urged countries that have not seen cases, or seen only limited cases, to get ready. However, "WHO continues to recommend no restriction on travel and on border closures," Chan said. "The virus is not stoppable," she said. "I would advise them to maintain vigilance, enhance surveillance and be prepared for the arrival of the novel H1N1 in their country." The U.S. Department of Health and Human Services and the Department of Homeland Security said those agencies have been acting for weeks as if Phase 6 were already in effect and no additional measures are planned. The United States declared a public health emergency on April 26. CNN's Martina Stewart, Senior Medical Unit Producer Caleb Hellerman and David S. Martin contributed to this report.